England, despite tactical flaws, pulled off somewhat of an upset against a team regarded as one of the best youth teams in the world, possessing over 600 more club appearances than their home opposition. It was an impressive display of technical abilities and whilst Germany were tactically superior both with and without the ball, Southgate’s side won to extent their unbeaten record on home soil which dates back to the reign of Stuart Pearce. 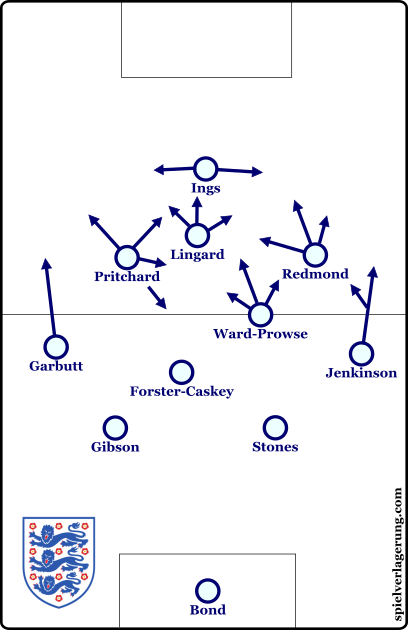 Southgate lined his England side up in a rather standard 4-2-3-1, which transitioned into a 4-3-3 at times especially against the ball and in their construction of possession from the back. In terms of the orientation of the players, Hughes had the most interesting role and was integrated well in most spaces of the pitch, most commonly dropping deep to help accelerate the build-up. Bond started as goalkeeper behind an attacking-minded defence of Luke Garbutt and Carl Jenkinson in the full-back positions, flanking a Ben Gibson and John Stones centre-back partnership. Jake Forster-Caskey was the main 6 and made situational dropping movements whilst James Ward-Prowse was much more of an 8 in his role. The highest central midfielder was Hughes, although at times he was instead the deepest, such was his role. Jesse Lingard and Nathan Redmond were positioned on the wings and made variable movements, often towards the centre of the pitch in support of the lone striker Danny Ings. In comparison, there were a few similarities with the positional game of Germany’s 4-2-3-1. The flexibility and movements of the midfield 3 were superior to their English counterparts however, whilst the construction game and contributions of the striker to the development of possession was better also. Barcelona goalkeeper ter Stegen was protected by a back four of Korb, Matthias Ginter, Knoche and Gunter, who were supported frequently in possession by Moritz Leitner and more-so Emre Can during the first phase. Schalke’s Max Meyer was the 10 for the away side with Leonardo Bittencourt and Amin Younes were threats out wide. The trio supported Philipp Hofmann who impressed as the single striker. Out of possession, there were a few flaws in England’s strategy which was exploited to decent effect by an opposition including great talents such as Emre Can and Max Meyer. There were some features of the English performance without the ball which were quite stereotypical of the league in general, however I feel that the visitors could’ve perhaps emphasised such aspects. One particular feature, was the poor compaction of England’s block, especially horizontally when the ball was in wide areas. This resulted in their struggle to press Germany at times during situations of wide possession, and thus could be contributed to the opening goal where Younes quite easily dribbled through and made an early cut-back to Hofmann after receiving a pass from a combination on the left. They looked to exploit this feature quite frequently by utilising simple rotational movements by the wide players, which was facilitated by the man-marking of wide players. 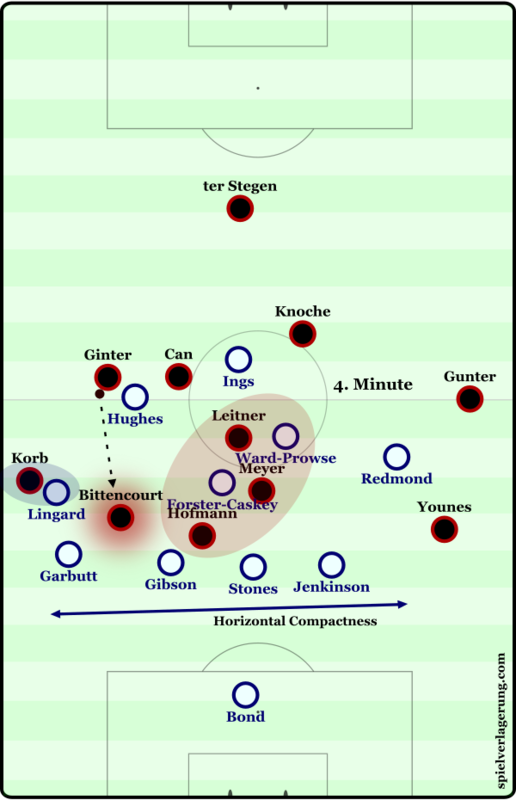 In the above scene, Korb moves to the touchline and takes Lingard with him, who ideally would’ve been in the half-space to support more spaces and to a greater extent. Bittencourt’s movement is too quick for Garbutt so he can receive a pass from the impressive Ginter in the half-space. This play is supported by the lack of horizontal compaction by England, as the distances from Redmond to Lingard are far too long. As a result, the midfield becomes unbalanced and an easy target for an overload, especially with addition of Bittencourt in possession who can utilise potential combinations or a free man to unlock the defence. The role of Hofmann here can also be highlighted as he drops slightly to support the possession game. Germany also used some intelligent movements from the central trio to exploit England’s man-marking. Despite using a 4-2-3-1 formation, the triangle was often inverted to match Can, Leitner and Meyer, seemingly in an attempt to restrict their creative abilities. Knowing this, Germany used quite far-reaching movements from the centre, with Can and Leitner dropping into their respective halfspaces whilst Meyer was variable. The intentions of these actions were not always to try and gain better access to the ball, but at times they looked to open passing lanes through the midfield, for Hofmann or either of the wide players to receive vertical passes, which Ginter especially was making to great effect. As expected, England looked to develop the ball carefully from the defence, yet they had a few issues in doing so. To start with, neither Stones nor Gibson hold great ball-playing capabilities and were unable to utilise passing lanes to advance the possession themselves. Instead they looked to quickly pass the ball onto Forster-Caskey or develop the play in wide areas which are much weaker to occupy. The Brighton midfielder didn’t contribute greatly to the distribution of the ball either, as he didn’t display a very expansive passing range. In contrast, Germany looked much more promising during these situations. Matthias Ginter displayed great passing ability to penetrate the midfield quite frequently whilst the dropping of Can and Leitner helped; both of whom possess greater passing ranges to that of Forster-Caskey. The influence of goalkeeper ter Stegen cannot be ignored either, as he created a 3-chain at times, meaning that the dropping of a 6 wasn’t necessary, so the likes of Can could contribute to overloads behind the first English line of pressure. 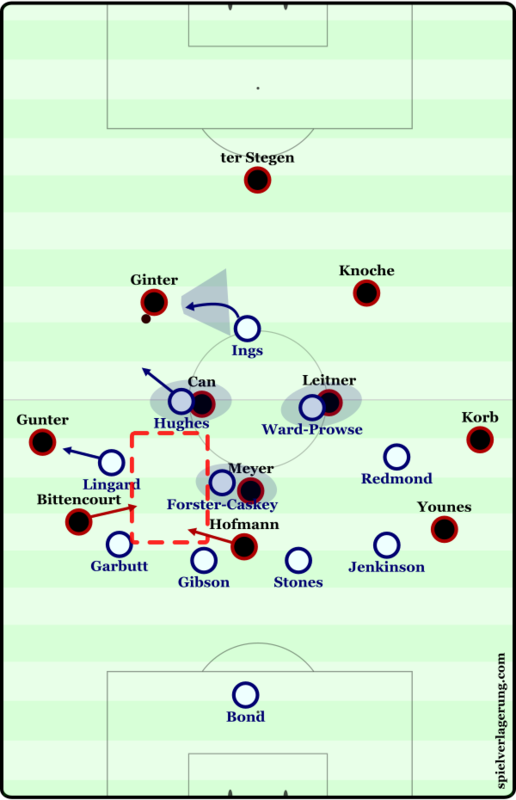 The pressing of the two sides obviously had an impact also, as Germany controlled the central space to a better extent whereas England were more stretched and failed to utilise cover shadows to a great effect. Both teams pressed in a 4-4-2 shape, as Will Hughes advanced alongside Danny Ings as the first wave of pressure. The home side were quite passive during Germany’s construction, especially when one of the 6s dropped and given their poor control of passing lanes, this was often counter-productive for Southgate’s side. Situationally, England pressed in a 4-3-2-1 shape so to match the midfield triangle of Germany. 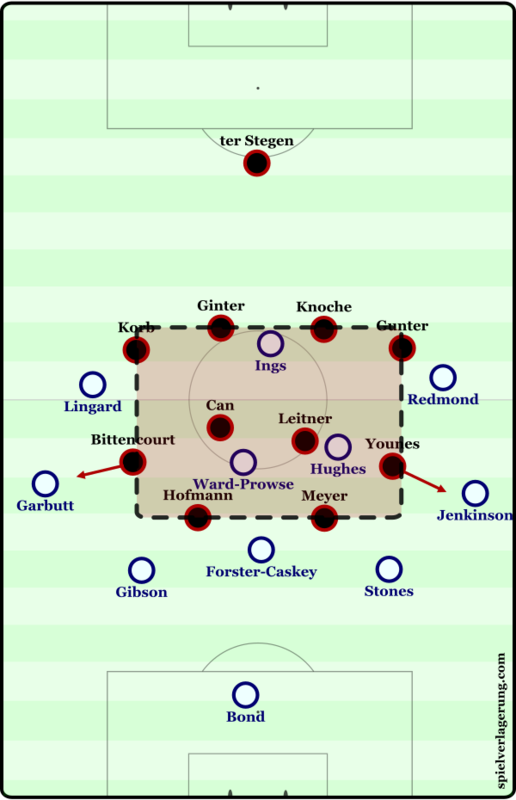 Whilst Ings pressed the centre-backs and often looked to cut off the square switch, Hughes and Ward-Prowse were man-marking the two German 6s whilst Forster-Caskey had the task of covering Max Meyer in attacking midfield. Because this was so dependent on man-marking in midfield, it was quite often unstable with quite simple movements being able to disorganise the shape. In addition, the channels were often open on either side of the English 6, which were utilised often by Hofmann, either wide player or in some cases an elevated 6. 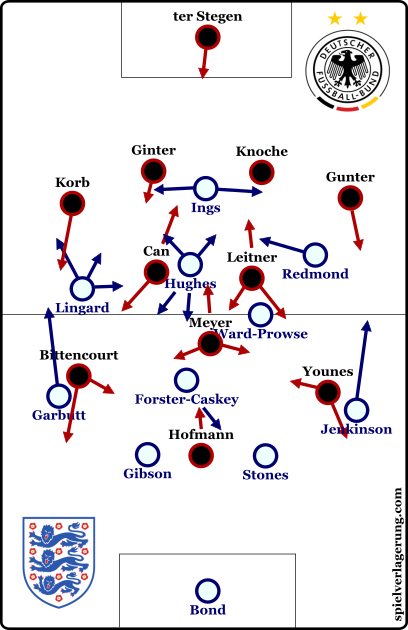 Germany’s 4-4-2, on the other hand, was one more representative of the ‘modern’ formation as it possessed greater stability and control of the centre and half-spaces. This shape often became an asymmetrical 4-3-3 as the ball-near winger moved higher to improve compaction near the ball whilst reducing the ability to make progressions into the space ahead. However, they didn’t manage to maintain the same levels of compaction and spatial control during England’s wide possession. Their shifting across was often slow and to an insufficient level which meant that the centre could be accessed by England from wide positions, by utilising diagonals after initially moving the ball towards the touchline. Hughes, one of England’s best players, supported this particular aspect of their possession game, as he made numerous dropping movements (usually towards the half-spaces) during England’s construction of possession. This was usually after a bit of a prolonged period without any penetration, so the Derby midfielder would move deeper with the intentions of supporting this. Interestingly, he holds a similar role for his club side in the English Championship – where he often moves to wide possessions and supports the centre-backs in bringing the ball out from the 1st phase. His pressing resistance was also a highlight of his performance and it contributed directly in the build-up to the first English goal. Upon receiving possession on the left, he was pressed immediately be a cluster of German midfielders, upon dribbling away from the pressure, he initiated a switch to the right where Jenkinson could drive forward as Meyer failed to shift across in time. Southgate made a quite interesting change when he replaced Will Hughes with Alex Pritchard in the 66th minute. Pritchard has had an excellent season on loan at Brentford in the Championship, and is amongst the best attacking midfielders in the league (though beaten by Wes Hoolahan to number one) as Pochettino is looking to incorporate him into his 25-man squad for next season. However, in his role against Germany, he featured on the left wing. One of the Spurs player’s best attributes is his versatility, as he possesses quite a wide skillset which allows him to have a strong effect in most areas of the opposition half. This definitely contributed to his left-wing role for England which allowed Jesse Lingard to possess a central role alongside Danny Ings. Pritchard was constantly making inside movements and was much more oriented to the centre of the pitch than Lingard in the same position, often acting as a second 10 alongside Lingard. The role of Pritchard came into fruition for the equaliser, as he broke into the ten space from the left half-space and assisted Redmond who scored following a lucky deflection, whilst he was involved in the small 4v3 overload on the edge of the box which led to Ward-Prowse being the free player to score the winner. Another thing of note from the late winner was the assisting player, right-back Jenkinson had cut inside to be inbetween the defence and midfield, and showed good composure to pick out the correct pass in pressured conditions. The West Ham defender had started making more inside movements as the game progressed, and threatened on more than just this one instance. The game was a good display of technical ability from both sides, though England in particular lacked in some tactical aspects however it was certainly a promising performance overall for the home side. 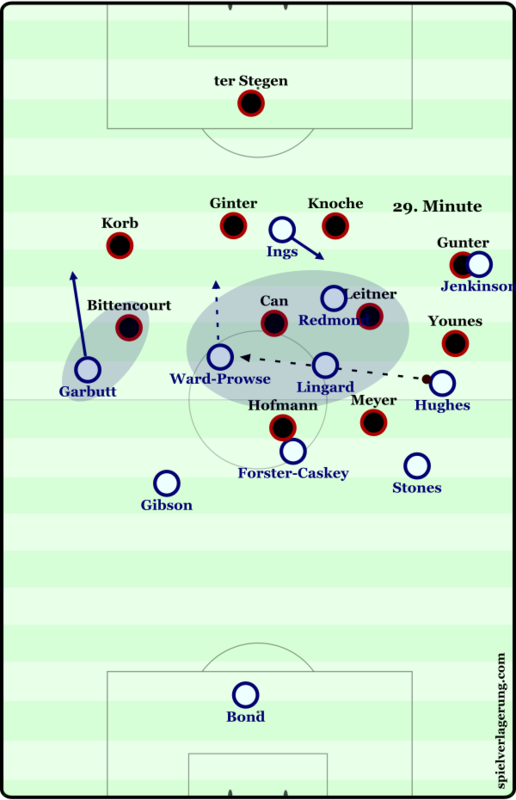 Their winner, including a 35-pass build-up, was one of the highlights (even if the majority of passes were in the ‘U’ shape around Germany’s defensive block and not actually penetrating) and suggests that we may not have to endure much more of Phil Jones marshaling the midfield.